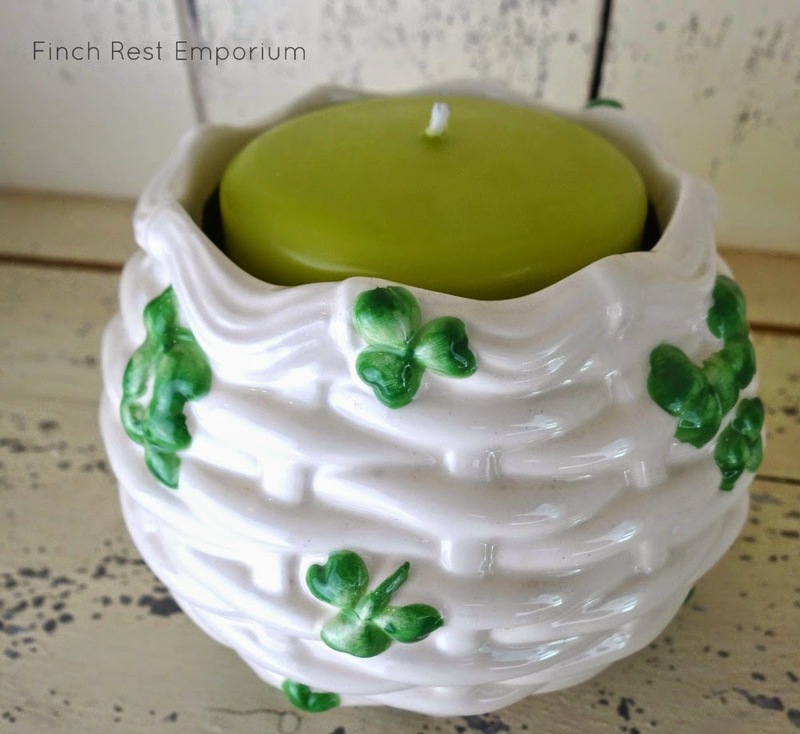 a few of my shamrock decor items! I have, um, a few. Some of you know what a special day this is to me. If you have any orange on, take it off or I will come pinch you! by the wee faerie folk! I very seldom take off my Claddagh ring but did for this pic for you! I got this on an Ireland trip with my father and 5 siblings years ago. of dark green Connemara Marble. One never knows where one will find shamrocks around here! at my 15-year-old shamrock plant! I recently divided it so now I have two. They insist on very bright sunlight. So, how is it they grow in cloudy rainy Ireland then? from my dear eldest daughter many years ago! 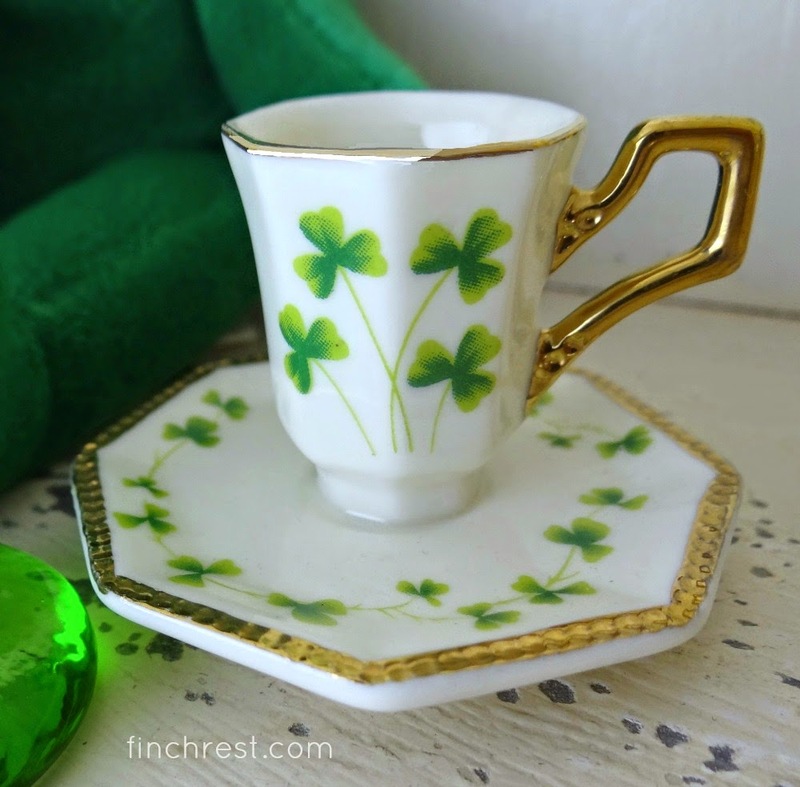 "Lucky Shamrock" teacup set by Hammersley. I adore this and only use it on St. Patrick's Day. It's really one I would be heart broken to have break. HAVE YOURSELVES A SAFE AND FUN DAY! So I am Irish too! 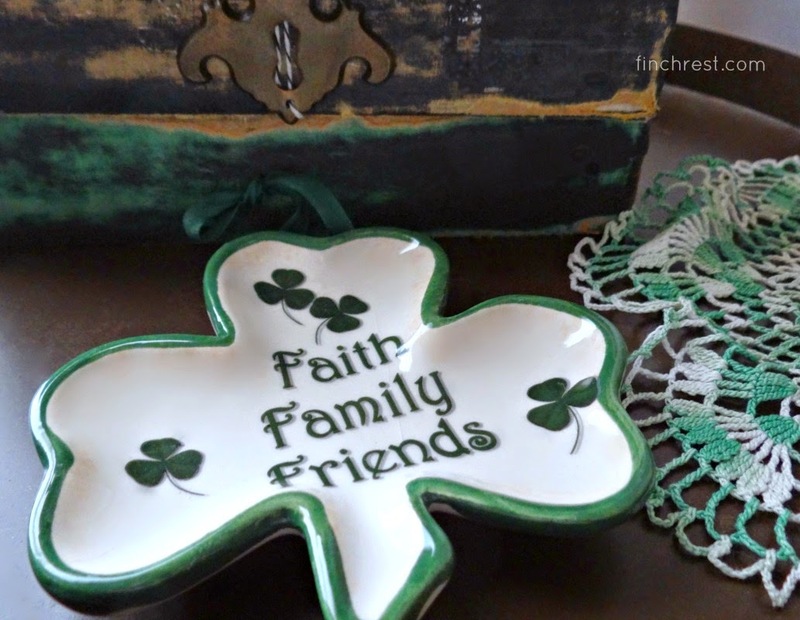 What special Irish keepsakes you have...they are all lovely, and your shamrock plant's history is touching. Lovely, everything is! The dishes, your keep sakes and the ring is beautiful! Happy St. Patty's to you sweet Irish laddie. 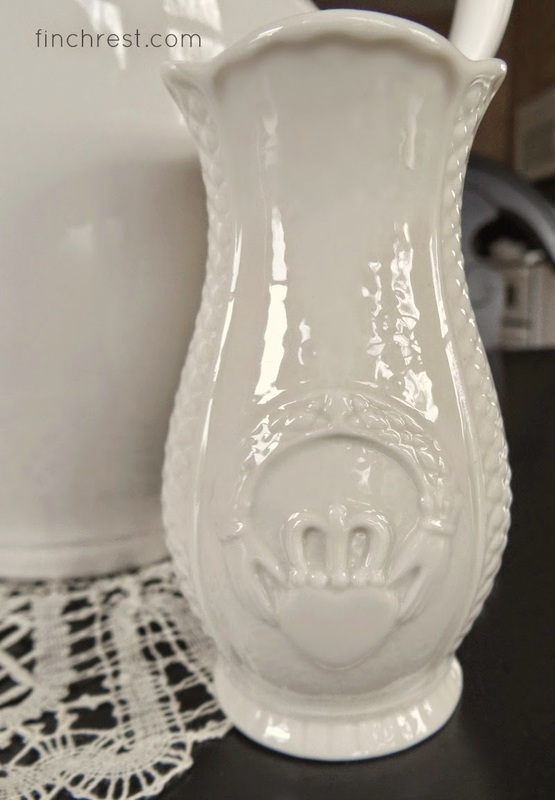 Love your teacups,Michele! Have a Happy St.Patrick Day! You have a great collection of St. Patrick's Day pretties. And loving memories too. Happy St. Patrick's Day. Hi Michelle...I know you have a fab collection of Irish goodies! Love your wonderful china and no wonder you love your special ring! Have a wonderful day, my friend, and thanks so much for linking to Tuesday Cuppa Tea! Happy St Patricks Day to you, it obviously means a lot to you. You have a wonderful collection, your ring is a delight, stunning. Happy St. Patrick's Day. Wonderful collection and memories. Happy Tea Day, too! You have some great teacups! Happy St. Patrick's Day! Happy St Patrick's Day, Michele! You have such a wonderful collection and I like the story behind your shamrock plant. Your ring is a delight and I'm sure it brings to mind many lovely memories of Ireland. Thank you for sharing this with us and joining me for tea today. Enjoy your day! 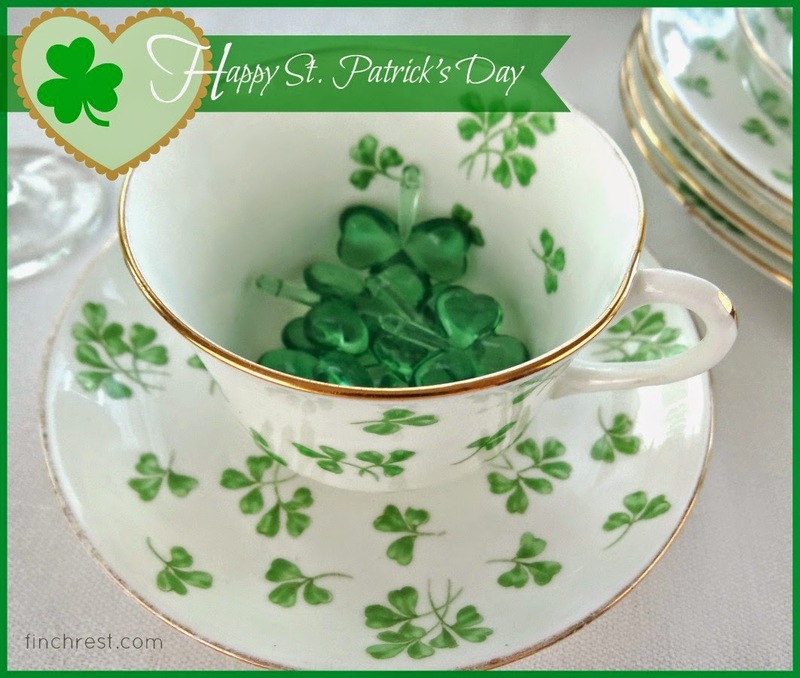 Wonderful treasures for celebrating St. Patrick's Day! Your teacup and saucer from your daughter is lovely and I'm sure tea tastes even better. Hope your day is very warm and green! Happy St. Patrick's Day, Michele. You have quite a lovely collection of Irish treasures. 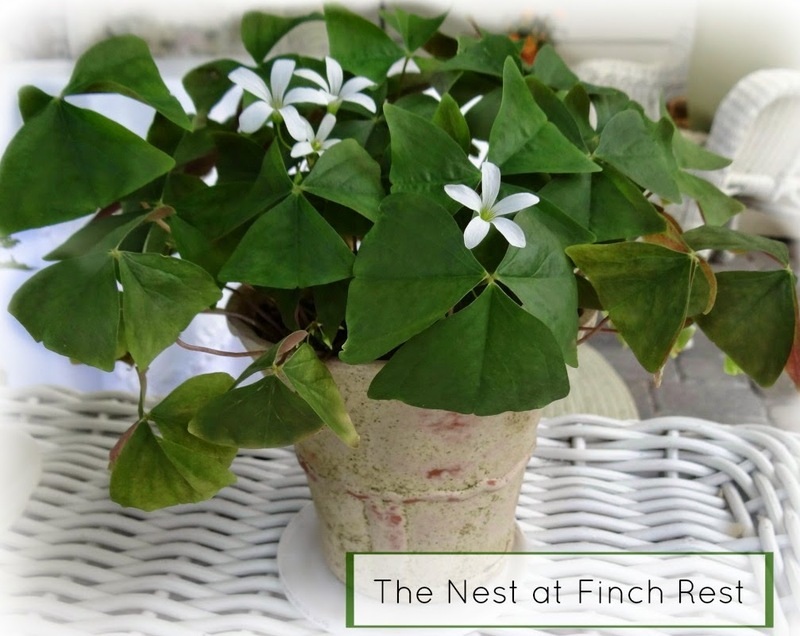 Oh my - so many darling Irish items are featured but a 15 year old plant is really something to admire. I don't have those green thumbs like you where houseplants are concerned. Thisn is a very fun post your shared Michele! Happy St. Paddy's Day, Michele! I did remember to wear green today. Hee! 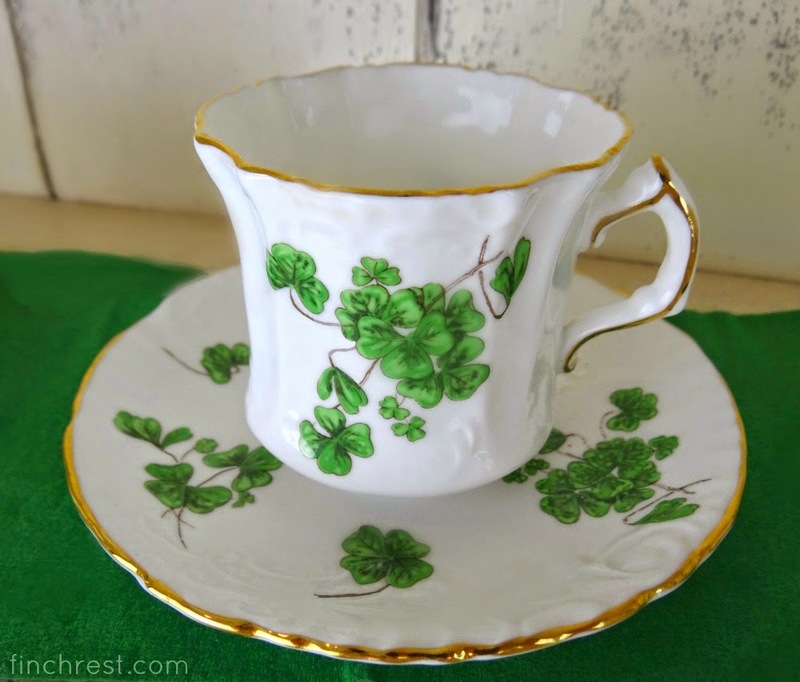 Your shamrock collection is charming! Happy St. Patrick's Day, Michele. You have a special collection. Lovely collection. I agree, the Hammersley is really pretty! Visiting you from Rose Chintz Cottage. What a lovely collection you have, Michele. I hope you had a wonderful St. Paddy's Day! I was blessed to visit Ireland with my late beloved, and oh, what memories I have from that trip. 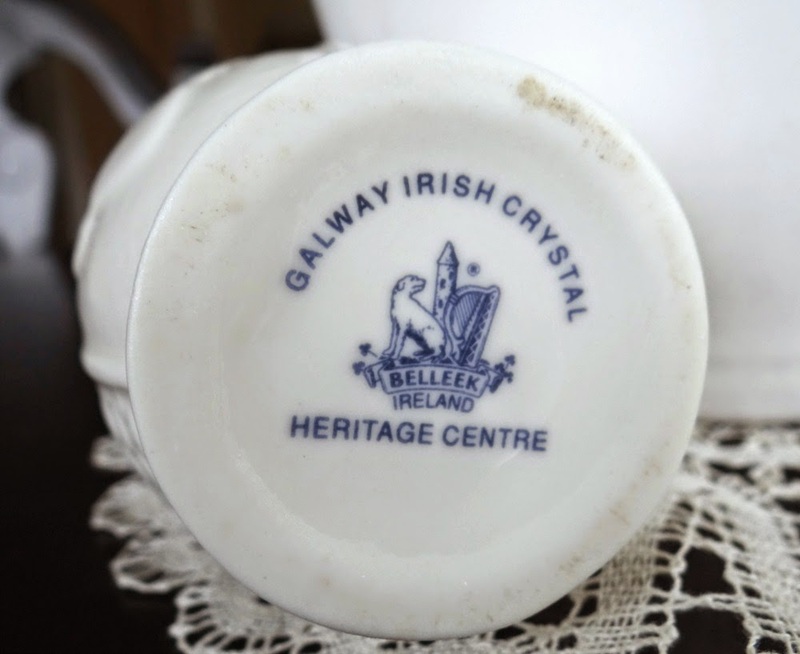 I always love to see your shamrock teacups. They are beautiful. Lucky Shamrock is very special. Happy St. Patrick's Day, Michele! I didn't know that you had such an affinity for Irish things! you have a nice collection. I love the live shamrock plant you have! Hopefully, it's been bringing you lots of good luck. What pretty details! Hope you had a wonderful day. 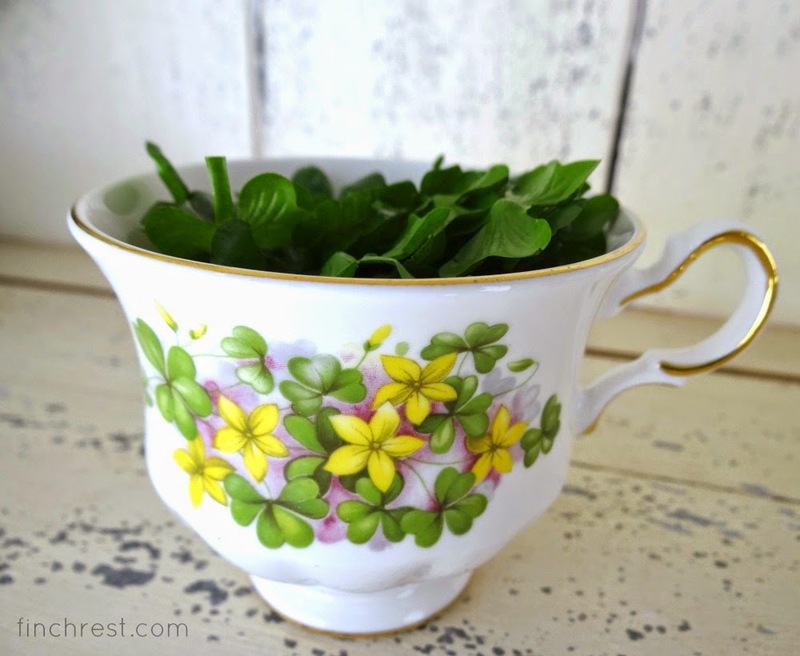 YOUR pic, reminded me of our clover covered Cretan fields, right now; what darling little hearts in that pretty teacup! 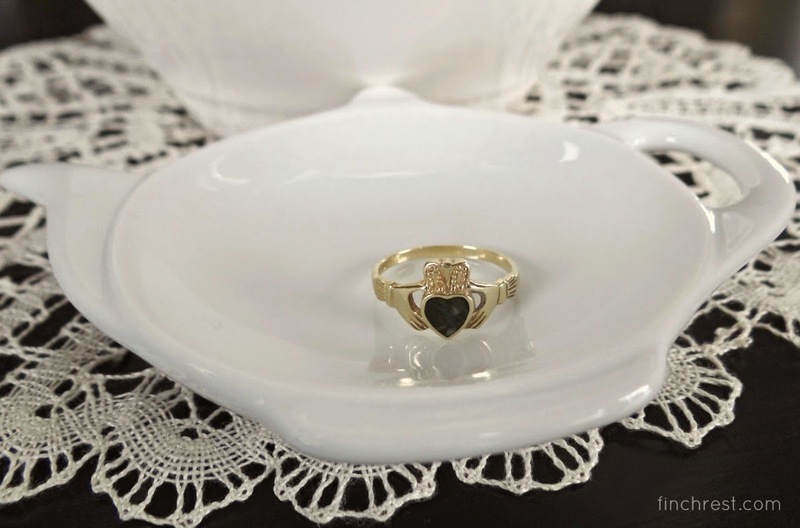 All of your Irish mementos are lovely, and what a special ring. Thanks for sharing your lovely memories. Happy belated St. Patrick's Day. Some lovely china. And what a great trip that must have been for you all. I can see why the ring is extra-special to you. I adore St Patrick's goodies and decorations and your's are lovely. What a delightful blog post. Happy Spring. I loved seeing some of your pretty shamrock things. Shamrocks are fun, aren't they? Hi Michele! Love your collection. 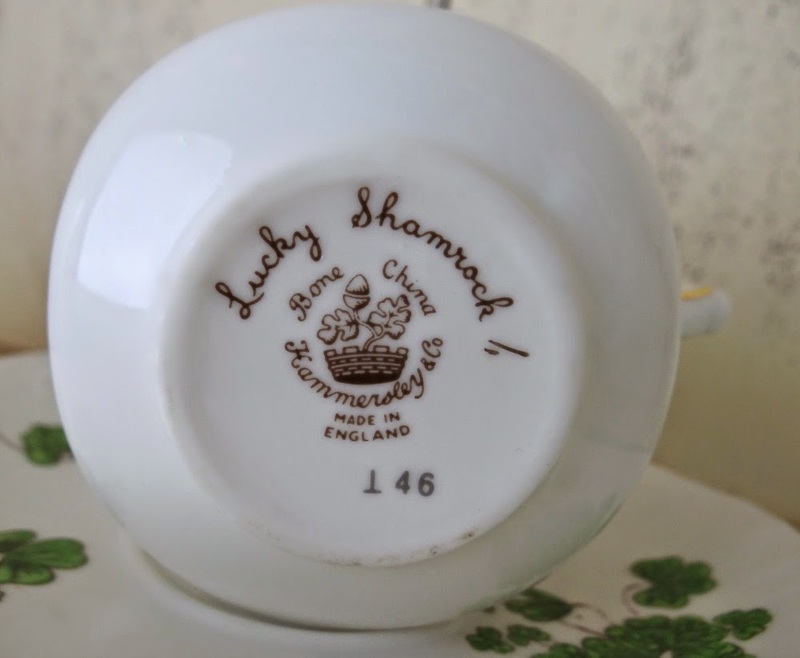 I can never find shamrock china. Your teacups are beautiful! And I can't believe that you have had that sweet shamrock plant for 15 years. That's amazing. I didn't know that we weren't supposed to wear orange on St. Patrick's day. Why is that? Got way behind on my blog reading because of juggling multiple deadlines last week, but I KNEW I would find some St. Patrick's Day fun here when I returned! And after all, it's entirely thanks to you that I have any St. Patrick's Day teawares myself. I love the photos you shared but especially all the little tidbits and stories behind them. These are the things that I think make "things" more than just "things"!